Although the Jedi Temple was destroyed by the Empire during the Sacking of Coruscant, its ruins still speak of its former glory. After the temple was bombed in the initial attack, the upper floors were deliberately collapsed on Darth Malgus's orders. The Jedi Temple's tower, once a Coruscant landmark, broke free during the bombing and fell to the city's lower levels. The old Jedi Council chamber is the only room left largely intact, but it is still considered dangerous and prone to collapse. The temple ruins have continued to see strife even after the Sacking of Coruscant. They were the site of a duel between Darth Malgus and the Jedi empath Aryn Leneer before Imperial forces were withdrawn from the planet. Exceptionally brave and lucky looters have also disturbed the ruins, hunting--and often finding--valuable Jedi artifacts. Twenty years ago, the old Galactic Market was a bustling center of commerce where the goods and wealth of the galaxy flowed freely. Since the Treaty of Coruscant, however, the market has become a shadow of its former self. 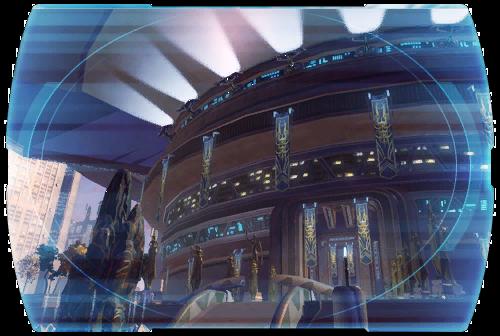 The old Galactic Market was the site of extraordinary scenes after the war. Thousands of homes in the lower reaches of Coruscant--most belonging to poor families--were destroyed during the Imperial invasion. The homeless families squatted in the marketplace; when ordered to leave by Republic military forces, the squatters rioted in protest. The market has never been truly safe since, and the criminal Migrant Merchants' Guild has gradually established its own control over the area. While careful and well-armed visitors can still find useful technology or rare weapons there, most are advised to stay away. Impressive as Coruscant's shining towers are, they could not exist without the less-glamorous Works, the heavy industrial complex deep below in the lower levels. The Works is home to Coruscant's hydrosupply stations, pollution-processing plants and electrical generators, staffed by droids who can survive accidents in the Works' dangerous machinery. Some of Coruscant's more desperate homeless hide in the Works, tapping the pipes for water and sleeping under the power conduits to keep warm. Occasionally they will break a major pipeline, causing blackouts and water shortages on the levels above. One Senator, while demanding harsher penalties for vagrancy, found his water supply mysteriously cut off forty times in a month. The proud capital of the Republic, Coruscant is the largest, the oldest and the most diverse city-world in the galaxy. Kilometer-tall buildings cover virtually all of the planet's surface, with the wealthy and powerful living at the top and the poorest and the most desperate dwelling near the foundations. Coruscant is only now recovering from the attack by the Empire that led to the eventual cease-fire. Many buildings were reduced to rubble; a few still burn, the fires fueled by chemicals and uncontrolled reactors. During the Empire's attacks, the criminal underworld increased its power base as well, and remains a formidable threat.